In an address at a symposium on accompanying young people, Cardinal Vincent explained that Europe is not just the European Union. The Council of European Episcopal Conferences (CCEE) includes all countries of the continent and, perhaps especially for the majority of young Europeans, the experience of living in Europe is not easy, is not comfortable, and is not stable for those who have arrived in Europe from the East. In a homily given at Mass later the same day, the Cardinal said, ‘we remember that our task is always to help [young people] discern the will of God for them, the greatness to which our loving Father is summoning them’. He added that this required ‘being open to the Holy Spirit, of wanting, in humble obedience, to discern the promptings of that Spirit and to respond, step by step, to that challenging call’. He noted that the task of those who have pastoral care of young people, is to ‘strive to understand the dynamic of the Holy Spirit at work in young lives, and to understand our part in serving that dynamic’. The symposium, which was organised by the CCEE, took place in Barcelona from 28th to 31st March, and brought together 275 experts in the pastoral care of young people, schools and universities, and vocational and catechetical work, from the Bishops’ Conferences of Europe, and accompanied by 32 bishops. It had as its theme the accompaniment of young people to enable them to respond freely to Christ’s call. 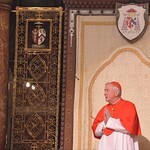 You can read the full text of his homily here.